So there I was, in JPUSA’s dining hall, looking for a guy in a Pig Pen T-shirt with a ring of keys the size of a hula hoop attached to his waist I didn’t know much about him other than he ate mushroom gravy every Saturday night, and was careful not to dribble on his long gray beard. I spotted him scraping up the last of his plate. After sitting down and talking to Tim “Spike” Davis about his various jobs at JPUSA, I discovered his most important one wasn’t listed on his resume. It’s using humor to open doors to share his faith, something he’s done for close to thirty years. Over time, Spike learned how to fix cars, even those destined to be pancaked at a junk yard. He got promoted to the duty of rescuing vehicles, or Jesus People’s Car Whisperer. He traveled as far as Wisconsin to retrieve abandoned cars, resurrect dead batteries, and pop locks when keys are left inside. I had to ask Spike his craziest JPUS-AAA story. It wasn’t a flat tire on the Dan Ryan during rush hour, but a faulty car door. It came off its hinges—and so did Spike—when it spun out into a busy Chicago intersection. According to car-door years, this guy is still too young to get on the good rides at the fair. Cartoons like these were the door Spike used to share his faith when he appeared on Animal Planet’s reality series, Monster Island. Tim was selected from over seventy expert hunters from around the world, many with sharper knives, but none with sharper wit. He knew he had a shot during a Skype interview with the executive producers. “They were rolling on the floor in their expensive tailored suits,” Spike chuckled. 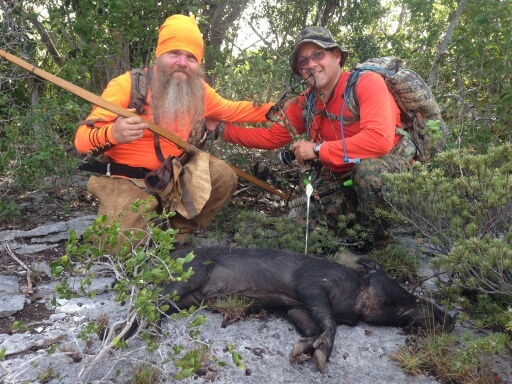 Soon afterwards, he found himself at the airport checking his primitive bow heading for an island inhabited by wild boars. Starring on the show didn’t change Spike’s life, but his appearance did change others. Tim used his cartoons to open the door to share the Gospel with the crew members, none of whom had stepped inside a church. He even shared his faith with the Hollywood director, who never met a Christian he didn’t want to punch in the face—or feed to wild hogs—until Tim. But now Spike is back in Uptown tinkering with cars. What’s his final word of advice? As Tim got up to return to work, I thought of a cartoon that he might create to summarize our visit. It would encapsulate this: Car doors that open while you’re driving? Not good. Doors that open to share your faith? Very good indeed. Check out Tim’s work at his websites: Red Jaw Cartoons and Scattered Thoughts. Tim was also the founding front man of Crashdog, one of the first Christian punk bands. Click here to see him. See Tim on Monster Island here.